Well, you should be! While municipal drinking water in the U.S. is among the safest in the world, almost all of the 25 largest city water systems have reported violations of federal drinking water standards. These include samples that contained significant levels of chlorine, lead, E. coli bacteria, and other contaminants. Think you’re better off drinking bottled water instead? Sorry, wrong again! Bottled water is even less regulated than tap water and has been found to contain a number of contaminants, including potentially harmful chemicals from the plastic bottles that can leach into the water. Fortunately, there’s a simple solution — installing a water filter in your home. 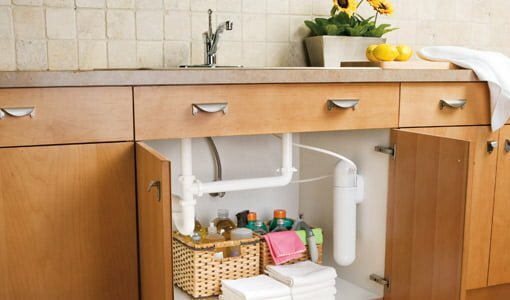 While some models may require a visit from the plumber, many are a snap to install. They’re easy to use and available to fit any budget or lifestyle. Plus, you’ll save money compared to buying bottled water. Here’s an overview of water filters and how they benefit your home. Carbon: The most commonly used filter due to its high adsorption rate and low cost. May be impregnated with silver to help kill bacteria. Reduces lead, mercury, and chlorine, along with some organic chemicals and pesticides, while improving odor and taste. Carbon water filters do not eliminate heavy metals, nitrates, arsenic, or many microbes. Ceramic: Made from fossil shell material. Unlike carbon, ceramic filters can be cleaned and reused. They are often combined with a carbon filter for more complete coverage. Ceramic water filters can remove bacteria, cysts, and asbestos, but not mercury or lead. Reverse Osmosis: Water is forced through a semi-permeable membrane under pressure. They are large, slow, expensive, and waste several times more water than they clean, but produce highly filtered water. Reverse osmosis water filters can remove most contaminants including heavy metals, nitrates, arsenic, chlorine, pesticides, and bacteria. However, they also remove minerals that may be necessary for good health. Water Distillation: Water is boiled and the steam is then condensed. Distilling water kills microbes and removes lead and mercury, but some chemicals may pass through. Also, it can remove minerals that may be important for good health. UV Radiation: High intensity ultraviolet light kills microbes present in water, but does not eliminate most chemicals and other contaminants. 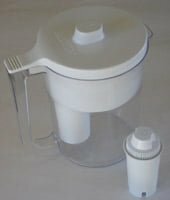 There are several different types of water filter systems available that vary in both cost and convenience. Water is poured into a reservoir and drips through a filter into the pitcher. Simple to use, no installation required. Filtering is slow and limited to what the pitcher can hold, filter may clog over time. I need a water system for the entire house. Good drinking water is a plus, now my water tastes bad. How much doesn’t matter, I just need to know which one to go with. I have two water heaters if that matters. And can I get one from Lowe’s or Home Depot? Thanks for the impartial and very informative article on water filters. I found this to be a very good read. I see tons of articles on INSTALLING undersink water filters, but NOTHING on UNINSTALLING them… removing them completely and going back to original plumbing. Where can I find instructions to do that? Thanks ! I have a whole house carbon filter on the cold water tap in the kitchen for my ‘clean’ drinking water. My small town does not put extravagant amounts of chlorine in the water like some towns. Notice all the new commercials for the pro-biotics(meaning good bugs) in yogurts advertising. The chlorine kills the good bugs in your stomach and with reduced good bugs, causes you to get sicker easier and longer. But if you live in a town that puts fluoride in it’s water? Sue. You can be poisoned(white dots on teeth,plus liver damage) by that ‘free’ industrial waste(fertilizer plant by-product) that is put in public drinking water for your fabricated, teeth health. And Chlorine levels that will quickly kill fish are not good for anyone. Why else would towns want the old and very young to boil their water.